WATCH What's the Most Beautiful Place in America? intro: What's the most beautiful place in America? "Good Morning America" set out to settle the debate. We asked you to tell us what you think is the most beautiful place in the United States. Thousands of photos poured in from across the country showcasing breathtaking views, true natural beauty, unique local landmarks, jaw-dropping landscapes, many with awe-inspiring stories to match. Read below to see which spots made it onto "Good Morning America's" 10 Most Beautiful Places list. We've listed the places alphabetically and want to hear which one is your favorite. 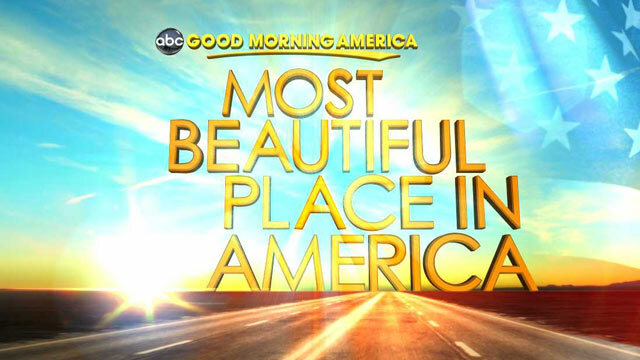 This week, "GMA" will take viewers to the most beautiful spots in the United States, all nominated by you! quicklist: 1 title: Asheville, N.C. text: "GMA" viewer Alan Ostmann of Candler, N.C., nominated Asheville, a small city tucked in the Appalachian Mountains rich with art, architecture and outstanding scenery. "I live just outside of Asheville, N.C., [bordering] the Pisgah National Forest in possibly the oldest mountains on the planet," Ostmann wrote in his submission. "Four miles from my home is the Blue Ridge Parkway. The forest and parkway allow some of the most spectacular views I have seen anywhere in the world. I hike and bike the area daily and am always amazed at the beauty nature can reveal to us." quicklist: 2 title: Aspen, Colo. text: Aspen is an authentic mountain town best known for its world-class skiing in winter months and as an outdoor playground for mountain biking, rafting, fly fishing, rock climbing, hiking and more in warmer months. Tessa Lemke of Carbondale, Colo., submitted a photo of the magnificent Pyramid Peak, part of the summits of the Maroon Bells, a short drive from Aspen, which gave us our inspiration. "Every drive into Aspen has this beautiful view -- ever changing from red rock to snow-covered," she wrote. "To me it doesn't look real ... like something from 'The Lord of the Rings.' Breathtaking!!" quicklist: 3 title: Cape Cod, Mass. text: Cape Cod has long been a favorite summer vacation destination made popular by the Kennedy clan and others. The 400-square-mile peninsula is filled with beaches and caters to tourists, but the cape's natural beauty is what compelled Gary Accabo of New Haven, Conn., to nominate the area. "I have visited Provincetown, Cape Cod every summer since 1977. Race Point is the most gorgeous part of the National Sea Shore. To be there in the evening to experience a sunset is one of the most breathtaking visions to witness. Its beauty is forever etched in my mind," Accabo wrote. quicklist: 4 title: Destin, Fla. text: Dramatic sunsets, miles and miles of seashore and sugar-white sand all make Destin, Fla., the "Most Beautiful Place in America" for "GMA" viewer Terri Rose of Niceville, Fla. When Rose submitted her description of the seaside town, nestled in Florida's northern panhandle, we knew we had to find that spot. quicklist: 5 title: Grand Tetons, Jackson Hole, Wyo. text: The stunning view of the Grand Teton mountain range has kept viewer Dolly Albers of Peoria, Ill., coming again and again to this spectacular spot. "Just sit ... and look out at those mountains anytime of the day or night. No place in America is more beautiful," Albers wrote. "[We] went there for our 25th [wedding] anniversary, again for our 40th, and last year for our 55th! We're been there in the winter to ski, spring to see the wild flowers, summer to hike and raft, fall to see the color changes. I close my eyes and see that view -- what more could you want?" quicklist: 6 title: Lanikai Beach, Oahu, Hawaii text: Lanikai Beach is a strip of paradise hidden on the island of Oahu. "How could this not be the most beautiful place in America?" wrote Lisa Basham of Kailua, Hawaii. "Bright, white, soft sand and clear, blue, warm water. This is the perfect beach to have a romantic picnic or get married. You can also have a great time with friends snorkeling, stand-up paddle boarding, or kayaking out to the beach on the Mokulua Islands." quicklist: 7 title: Newport, R.I. text: Viewer Lisa Gecelosky of Bernville, Pa., told us about Newport's wharfs, historic mansions, and famed Cliff Walk along the eastern shore, which caught our eye and landed this destination a spot on our list. The New England coastal town boasts spectacular scenery and a vibrant downtown area that makes it a perennial tourist favorite. quicklist: 8 title: Point Reyes, Calif. text: Outside San Francisco, Point Reyes National Seashore is a don't-miss destination. The park protects over 71,000 acres of wildlife and coastland, but is also a place to take in the great outdoors with hiking, camping, horseback riding and more. The view along this famed peninsula inspired Kathleen Rockwell of Oviedo, Fla., to send "GMA" this photo. "I found the most [beautiful] place in America so far to be in California. I visited there in January this year with my husband ... We drove over there to the top of the mountain and got out and walked around. The view looking at the Pacific Ocean from there was breathtaking -- you felt like you were in heaven," she wrote. "It was the most beautiful site I have ever seen that it made me cry ... seriously." quicklist: 9 title: Sedona, Ariz. text: Sedona's natural beauty takes your breath away. The Red Rocks inspire such awe that we had to name it one of our Most Beautiful Places in America. "The Red Rock Country in and around Sedona, Ariz., is one of the most beautiful and peaceful places I have ever visited in the U.S.," Robert Fruggiero wrote to "GMA." "This picture was taken from up on Bell Rock … during a yearlong cross-country RV trip." quicklist: 10 title: Sleeping Bear Dunes, Mich. text: Sleeping Bear Dunes National Lakeshore, tucked in the northwest corner of Michigan's Lower Peninsula, is one of the nation's best-kept secrets. That's why "GMA" viewer Jim Madole of Grand Rapids, Mich., nominated the spot.